I have recently attended an excellent 2-day workshop on proposal writing for the european commission’s new research funding programme, Horizon 2020, given by Dr. Sean McCarthy from Hyperion. I won’t write about the nitty-gritty details of proposal writing here, but one thing I got to know more as a sidenote in this seminar are Technology Readiness Levels (TRLs). Now this notion of TRLs allows us to formulate an interesting observation why the practical impact of academic research is, frankly, often quite crappy. University research in computer science largely falls into TRL 2, 3 and 4. In relatively rare cases it might mature up to 5, but that’s about it. Why do we not see our research through all the way until TRL 9? Well, there’s no publications to do. You can hardly publish that you tweaked your tool (which you have already proven conceptually sound) to also work in a relevant demo environment. It’s a lot of hard work, with very little immediate benefit for the academic. Hence, people do not do it. Companies, on the other hand, usually do not want to touch anything below TRL 7 or 8. They may have research departments that operate on TRL 6, but those are few and far between. Why? Simply because the risk-reward ratio is not right for them. Many of the academic ideas in lower TRLs might be sound in principle, but practical problems will still hinder their practical usefulness. Companies typically do not appreciate that kind of risk. It’s obvious that there is a gap that prevents even good academic ideas from being picked up by practitioners. This gap is often referred to as the Valley of Death. It’s the place where ideas go to die. This figure nicely illustrates why academics and people from industry often have such a hard time collaborating. Essentially, all parties silently assume that the other person will interface with them on the level where they typically start/stop. The academic assumes that the company will be willing to pick up their stuff at TRL 4 (they won’t). The company assumes they will receive technology on TRL 7 level (this won’t happen either). Everybody is unhappy and feels like the other person is not doing their job. However, practically speaking, everybody kinda is. The problem is that there is a job missing in the middle. Essentially, what is required is a person (let’s call her the Technology Transfer Agent) in the middle, who has the right incentives to take up TRL 3 or 4 technology and bring it all the way up to TRL 8. Clearly, this will not work every time. Sometimes, the agent will recognise on TRL 6 that 7 will already not be feasible, and the technology will remain an academic idea until somebody improves upon it. However, in many cases, it will work, and the world will (in theory) be a little bit of a better place. The european commission is also explicitly addressing this Valley of Death in their Horizon 2020 programme. For instance, they have established PPP (Private-Public Partnership) and the EIT (European Institute of Innovation and technology) to explicitly bring technology (some part) through the Valley and make them relevant to society faster. This is one of the best graphics and explanations I have seen describing technology maturation and the reason for the “valley of death”. From my many years of experience in upstream oil and gas industry technology development, I would say that It not only applies to software development but a wide range of industries. 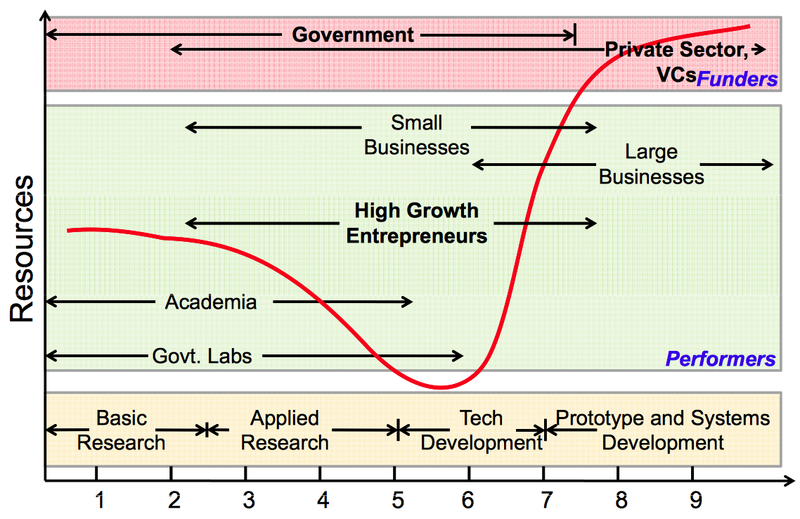 We hear generalities such as “early stage development” used in an attempt to define roles for Federal and VC type R&D. In reality this approach, in my opinion and supported by history, often leads to unnecessarily wasted Federal R&D funds. There is a need for careful evaluation of technologies during the valley of death phase (TRL not as relevant in this phase as you have so effectively described) to prevent prior investments in R&D from being wasted simply because industry was involved in a downturn or, for whatever reason, is being extremely conservative during this period and had no interest in anything but gaining market share with “proven” technologies and advertising. These downturns are sometimes also ascribed as being a period that “magically” spurs technology development; however, most often few consider exactly what technologies are being developed. I submit that these technologies are some of the ones at the far right side of the valley of death or technologies companies have kept secret and convinced will rapidly support market share development. If agencies want to include lower TRL’s in this advancement process during this period, they need to be willing to explore alternative means to engage industry and be prepared to invest more in a selective attempt to enable advancement of what they believe are “key” technologies to a slightly longer commercialization path than industry might have had in mind. Again, thank you for your analysis. I would like to use your diagram and discussion for internal use. I hope to hear from you regarding the above.